How you tune your bass drum(s) depends on preference and musical setting. Evans heads make 'matched pairs' of heads for a variety of different applications e.g., studio use. Other manufacturers such as Remo and Aquarian also make a variety of high quality heads for Bass Drums. Tensioning the heads evenly at each tension point until they are just wrinkle-free produces a big, warm thud with plenty of attack and few unwanted overtones. This is a good starting point for however you wish to tune your bass drum. To make the drum sound TIGHTER, tension the FRONT head SLIGHTLY HIGHER than the batter head. To INCREASE the 'BOTTOM END' de-tune the FRONT head slightly. To INCREASE the 'CLICK', tension the BATTER head slightly SLACKER. For non-miked gigs it is worth tuning in a bit more 'boom' (drum resonance) to increase the impact of the drum within the music. 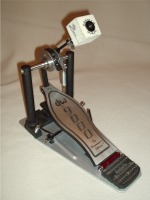 Some drum technicians comment that slanting the bass drum too much can influence the sound, reducing bottom end: it will certainly affect the 'feel' of your bass drum pedal as the beater will be striking the head before it is in the vertical position. When miking-up, a bit less resonance and a bit more click works well. Avoid filling the bass drum with grandma's duvet. This reduces the resonance AND makes the drum a lot QUIETER (unless that is your aim). It's better to learn to play quietly and have a better sounding drum. Then, IF damping is necessary keep it SUBTLE.